Who stands firm? Only the one for whom the final standard is not his reason, his principles, his conscience, his freedom, his virtue, but who is ready to sacrifice all these, when in faith and sole allegiance to God he is called to obedient and responsible action: the responsible person, whose life will be nothing but an answer to God’s question and call. After years of political instability under the Weimar republic, most Christian institutions were relieved with the ascent of the nationalistic Nazi dictatorship. The German Evangelical Church, the foremost Protestant church in Germany, welcomed Hitler‘s government in 1933. Dietrich Bonhoeffer, however, although a member of the German Evangelical Church, was not complacent. In his April 1933 essay, The Church and the Jewish Question, he assailed Nazi state persecution. With Hitler‘s ascent, non-Aryans were prohibited from taking parish posts, and when Bonhoeffer was offered such a post in the fall of 1933, he refused it in protest of the racist policy. Disheartened by the German Church’s complacency with the Nazi regime, he decided to accept a position at a German-speaking congregation in London. In October 1944, Bonhoeffer was moved to the Gestapo prison in Berlin. In February 1945, he was taken to the Buchenwald concentration camp, and then to the Flossenbürg concentration camp, where he was hanged on April 9, 1945. Hans von Dohnanyi was executed soonthereafter. 1 Bonhoeffer, Dietrich. “After Ten Years.” Letters and Papers from Prison. Enlarged Edition, Eberhard Bethge, ed. New York: The Macmillan Company, 1971, p. 5. 2 W. D. Zimmermann, ed. I Knew Dietrich Bonhoeffer. New York: Harper and Row, 1966, p. 150. Bonhoeffer, Dietrich. The Cost of Discipleship. Simon & Schuster. Bonhoeffer, Dietrich. “After Ten Years.” Letters and Papers from Prison. Enlarged Edition, Eberhard Bethge, ed. New York: The Macmillan Company, 1971. Bonhoeffer, Dietrich. Life Together: The Classic Exploration of Faith in Community. Harper San Francisco, 1978. Bonhoeffer, Dietrich. Ethics. Simon & Schuster. FOR THE first time in the United States,” said the book blurb, “a number of Christian thinkers gathered to analyze Bonhoeffer’s theological achievement for publication.” So eight of us claimed–I was editor–in The Place of Bonhoeffer, which in 1962 sold for $4.50 ($2.25 paperback), and now, Google will tell you, can be found for $55.00. I dug it out of its virtual time-capsule to prepare for a panel responding to Martin Doblmeier’s impressive film Bonhoeffer, which can be seen on PBS on February 6, two days after the late German theologian’s 100th birthday. All but one of the seven then-young contributors to Place Peter L. Berger, George W. Forell, Reginald W Fuller, Walter Harrelson, Franklin Littell, Jaroslav Pelikan and Franklin Sherman–are still with us and are influenced by Bonhoeffer in various ways. Bonhoeffer was way ahead of almost all European and most American theologians on the interracial front. He had been accepted in and had learned from Harlem churches during his year in New York in 1931. The Vatican Council was just beginning in 1962, so the ecumenical front, on which he was a pioneer, did not yet include Catholics. And the film Bonhoeffer demonstrates that however patriarchal he and his contemporaries now appear, he was theologically and personally close to powerful women. Most of the vigorous church women’s movements took off just after our attempt to “place” Bonhoeffer. The film takes seriously the fact that while Bonhoeffer sought the liberation of Jews, his theological thinking was still “1930ish,” since he often spoke of Jews’ value as potential converts to Christianity. Yet he died in the cause that included the future of Jews, and I’ve always thought he deserves recognition as a “Righteous Gentile” in Israel. The question we asked in 1962 Bonhoeffer had asked in 1944: “The thing that keeps coming back to me is, ‘what is Christianity, and indeed what is Christ, for us today? '” Momentarily he departed from his high Christology to envision an almost humanistic Jesus. It was at the time when he was chronicling the “world come of age,” obvious in Europe. With the recovery of high Christologies and a Christian boom in the poor and southern worlds he found a new place. John deGruchy, who figures large in Bonhoeffer, has shown at book length the part that Bonhoeffer’s thought played in ending apartheid in South Africa. It’s always a bit foolish to ask how someone in the past would respond to trends today. WWBD: what would Bonhoeffer do–and think? He foresaw how complacencies in mainstream Protestantism forebode decline, and he offered clues for addressing the situation that are still worth picking up on. He praised then and would praise now the vitality of African-American inner-city churches. While his writings appear in anthologies of spirituality, it’s hard to conceive of him making sense of the Jesus-spirituality that so appeals to individualist seekers today. In one famous essay he wrote that “Christ exists as community.” Many things in the newer evangelical expression he might admire, but not its slavish nationalism or its market orientation. How cool was that? Yes, I was baptized when I was in high school. 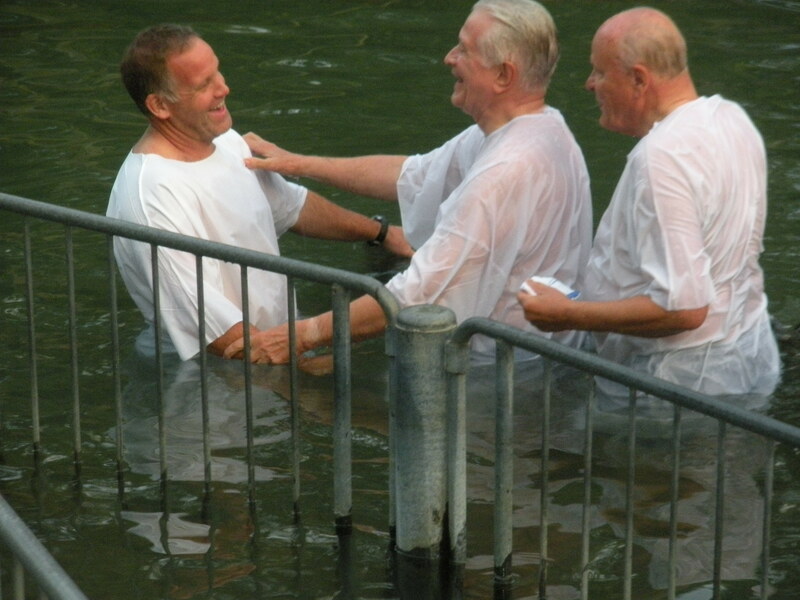 Today was a redication of my faith in the very river Jesus was baptized in by John the Baptist. In the photo is my father-in-law, Dr. Clifford Anderson (right) and Dr. Ron Youngblood (middle). 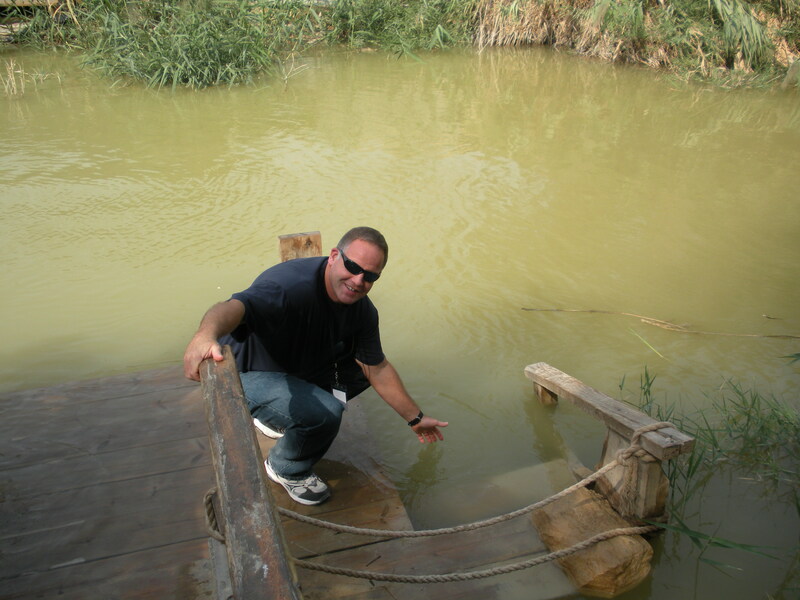 Yesterday, we visited the Jordan River and looked at the possible site where Jesus was baptized by John the Baptist. Of course, the River has changed banks since that time. It is also possible that the site took place on the Jordan side of the River. Here is a picture of me touching the water. As I stated a couple of days ago, my posts will focus more on some sites in the Holy Land rather than Dietrich Bonhoeffer. My wife, Lois and I, are on a tour. At this moment we are staying at a Holiday Inn in Tiberias, Israel right across the street from the Sea of Galilee. How cool is that. Yesterday we were in Petra. 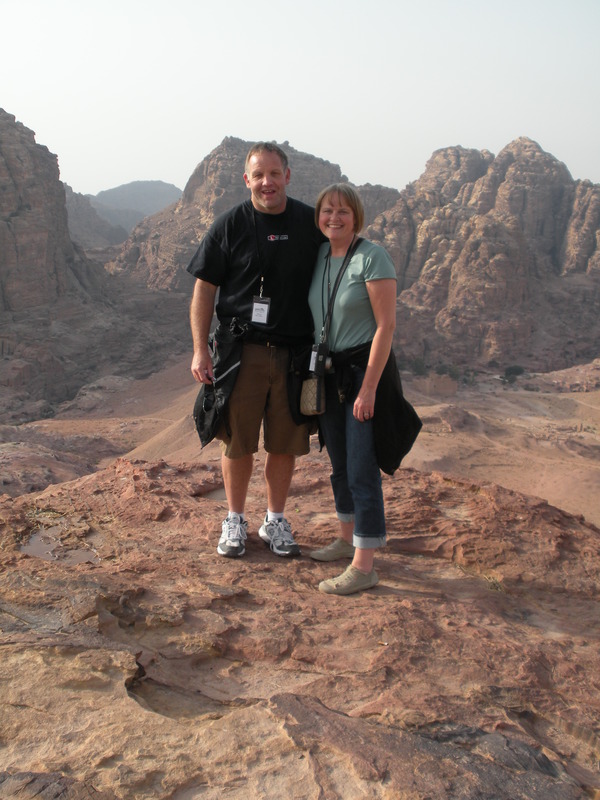 Here is a picture my wife and me standing on the high place of Petra. Over the next number of posts, I may or may not refer to Dietrich Bonhoeffer because my wife and I are in the Holy Land. Currently, we are in Amman, Jordan. One of the places we went to today was Mount Nebo. Mount Nebo is where God told Moses to go and look over the Promised Land (Deuteronomy 32.49). Moses would die on Mount Nebo. The day was a little hazy, but we saw the Jordan Valley, the Dead Sea and the Jordan River. 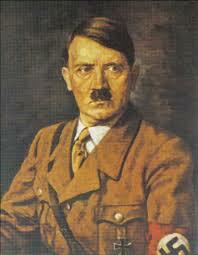 It is difficult to imagine how severe the situation was in days of Adolf Hitler. For Christians like Dietrich Bonhoeffer knew the dangers of standing for Jesus, yet they realized that being a Christian may sometimes mean great sacrifice. Bonhoeffer could not sit back and watch the church transform into Hitler’s puppet. The coddled Western World will sooner or later give way to great affliction. And when it does, whose vision of God will hold? Where are Christians being prepared for great global sorrows? Where is the Christian mind and soul being prepared for the sorrows to come? Christians in the West are weakened by wimpy worldviews. And wimpy worldviews make wimpy Christians. God is weightless in our lives. He is not terrifying magnificent. His sovereignty is secondary (at best) to his sensitivity. Geffrey B. Kelly and F. Burton Nelson, eds., Dietrich Bonhoeffer: A Testament to Freedom (San Francisco: HarperSanFrancisco, 1995) 17. John Piper, Spectacular Sins and Their Global Purpose in the Glory of Christ (Wheaton: Crossway Books, 2008), 13. I Finally Get to Go to Germany! Well, sort of. 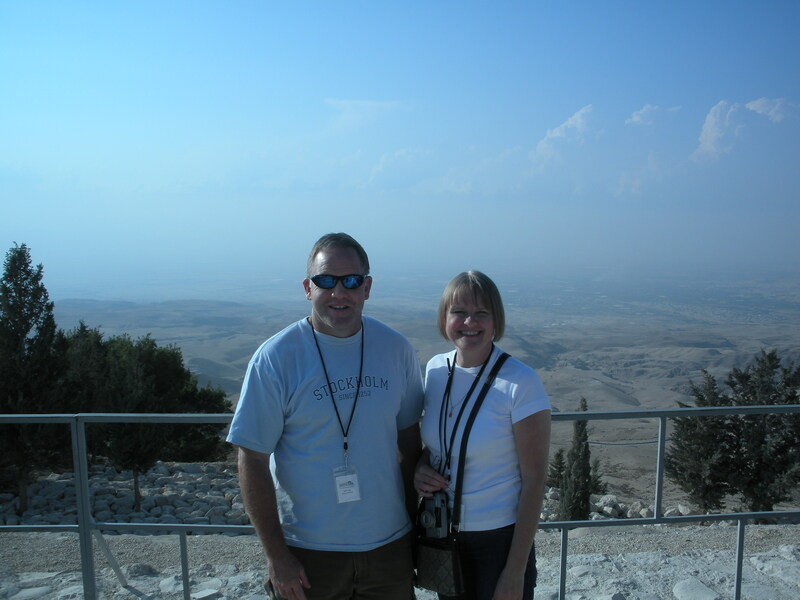 My wife, Lois, and I are going on to the Holy Land this week for a two-week tour. On the way there we have a layover in Frankfurt, Germany for seven hours! This will be my first time ever in the same country of Dietrich Bonhoeffer.